Anton Diabelli (born September 5, 1781, Mattsee, near Salzburg – died April 7, 1858, Vienna) was an Austrian music publisher, editor, composer, guitarist, pianist and pedagogue. He is best known for his waltz on which Ludwig van Beethoven wrote his 33 variations for piano (Diabelli Variations, 1823). Diabelli produced a modest number of works as a composer, including an operetta called Adam in der Klemme, a number of masses and songs and a large number of piano and classical guitar pieces. Among these are pieces for four hands which are still popular amongst amateur pianists. His religious music is widespread in Austria and the quality of his piano pieces assures wide distribution throughout. Anton Diabelli was born in Mattsee near Salzburg. His father was his first music teacher. At the age of seven, Anton joined the boys choir at the monastery of Michaelbeuern and later he was a choir boy in Salzburg Cathedral. Diabelli intended to enter the priesthood and entered the monastery at Raitenhaslach, where his studies were supervised by composer Joseph Haydn’s brother Michael Haydn. Diabelli left the monastery in 1803, when the Bavarian monasteries were secularized, and went to Vienna, where he taught piano and guitar, made arrangements, and continued to compose. During this period he learned the music publishing business. In 1809 Diabelli composed his comic opera in one act, Adam in der Klemme (Adam in a Fix), its first performance was on April 25, 1809 in Vienna. In 1818, Anton Diabelli and Peter Cappi, founded a publishing firm Cappi & Co.. 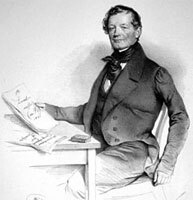 In 1824 he founded his own publishing firm Diabelli & Co.. Diabelli got acquainted with Viennese composers through his publishing activities. He issued an invitation in 1819 to many composers to contribute variations on one of his own waltzes in order to form a patriotic anthology published by his firm. About 50 composers responded, including Beethoven, whose monumental set of 33 variations was finally completed in 1823 and published separately as Diabelli Variations. He was the main publisher of Czerny, Strauss, Lanner and Schubert. Diabelli published several other works of Beethoven and was the principal publisher for Schubert, issuing the first thematic catalogue of Schubert’s works in 1851. Along with the educational literature, Diabelli composed a huge number of works and made arrangements for instrumental ensembles, his own compositions include operettas, church music, and numerous light pieces for piano, flute, guitar, and other instruments. Anton Diabelli died in 1858 in Vienna.